53:1.2 Lucifer was a magnificent being, a brilliant personality; he stood next to the Most High Fathers of the constellations in the direct line of universe authority. Notwithstanding Lucifer’s transgression, subordinate intelligences refrained from showing him disrespect and disdain prior to Michael’s bestowal on Urantia. Even the archangel of Michael, at the time of Moses’ resurrection, “did not bring against him an accusing judgment but simply said, `the Judge rebuke you. '” Judgment in such matters belongs to the Ancients of Days, the rulers of the superuniverse. 53:1.4 Very little was heard of Lucifer on Urantia owing to the fact that he assigned his first lieutenant, Satan, to advocate his cause on your planet. Satan was a member of the same primary group of Lanonandeks but had never functioned as a System Sovereign; he entered fully into the Lucifer insurrection. The “devil” is none other than Caligastia the deposed Planetary Prince of Urantia and a Son of the secondary order of Lanonandeks. 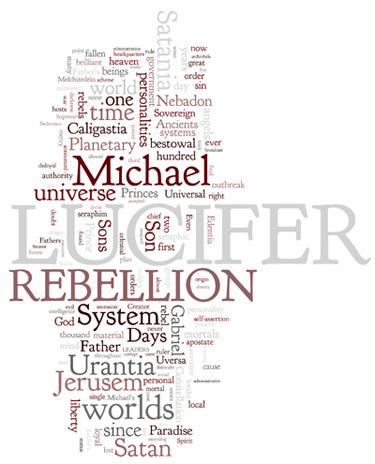 At the time Michael was on Urantia in the flesh, Lucifer, Satan, and Caligastia were leagued together to effect the miscarriage of his bestowal mission. But they signally failed. 53:2.1 Lucifer and his first assistant, Satan had reigned on Jerusem for more than five hundred thousand years when in their hearts they began to array themselves against the Universal Father and his then vicegerent Son, Michael. Most bitterly did he attack the right of the Ancients of Days—"foreign potentates"—to interfere in the affairs of the local systems and universes. These rulers he denounced as tyrants and usurpers. He exhorted his followers to believe that none of these rulers could do aught to interfere with the operation of complete home rule if men and angels only had the courage to assert themselves and boldly claim their rights. 53:4.2 Self-assertion was the battle cry of the Lucifer rebellion. One of his chief arguments was that, if self-government was good and right for the Melchizedeks and other groups, it was equally good for all orders of intelligence. He was bold and persistent in the advocacy of the “equality of mind” and “the brotherhood of intelligence.” He maintained that all government should be limited to the local planets and their voluntary confederation into the local systems. All other supervision he disallowed. He promised the Planetary Princes that they should rule the worlds as supreme executives. He denounced the location of legislative activities on the constellation headquarters and the conduct of judicial affairs on the universe capital. He contended that all these functions of government should be concentrated on the system capitals and proceeded to set up his own legislative assembly and organized his own tribunals under the jurisdiction of Satan And he directed that the princes on the apostate worlds do the same. 53:5.6 “There was war in heaven; Michael’s commander and his angels fought against the dragon (Lucifer, Satan, and the apostate princes); and the dragon and his rebellious angels fought but prevailed not.” This "war in heaven" was not a physical battle as such a conflict might be conceived on Urantia. In the early days of the struggle Lucifer held forth continuously in the planetary amphitheater. Gabriel conducted an unceasing exposure of the rebel sophistries from his headquarters taken up near at hand. The various personalities present on the sphere who were in doubt as to their attitude would journey back and forth between these discussions until they arrived at a final decision. 53:7.8 The greatest loss occurred in the angelic ranks, but most of the lower orders of intelligence were involved in disloyalty. Of the 681,217 Material Sons lost in Satania, ninety-five per cent were casualties of the Lucifer rebellion. Large numbers of midway creatures were lost on those individual planets whose Planetary Princes joined the Lucifer cause. 53:7.12 It was over two years of system time from the beginning of the “war in heaven" until the installation of Lucifer’s successor. But at last the new Sovereign came, landing on the sea of glass with his staff. I was among the reserves mobilized on Edentia by Gabriel, and I well remember the first message of Lanaforge to the Constellation Father of Norlatiadek. It read: “Not a single Jerusem citizen was lost. Every ascendant mortal survived the fiery trial and emerged from the crucial test triumphant and altogether victorious.” And on to Salvington, Uversa, and Paradise went this message of assurance that the survival experience of mortal ascension is the greatest security against rebellion and the surest safeguard against sin. This noble Jerusem band of faithful mortals numbered just 187,432,811. 53:8.2 Formerly, when the Planetary Princes, the “Sons of God,” were periodically assembled, "Satan came also,” claiming that he represented all of the isolated worlds of the fallen Planetary Princes. But he has not been accorded such liberty on Jerusem since Michael’s terminal bestowal. Subsequent to their effort to corrupt Michael when in the bestowal flesh, all sympathy for Lucifer and Satan has perished throughout all Satania, that is, outside the isolated worlds of sin. 53:8.3 The bestowal of Michael terminated the Lucifer rebellion in all Satania aside from the planets of the apostate Planetary Princes. And this was the significance of Jesus' personal experience, just before his death in the flesh, when he one day exclaimed to his disciples, “And I beheld Satan fall as lightning from heaven.” He had come with Lucifer to Urantia for the last crucial struggle. 53:9.1 Early in the days of the Lucifer rebellion, salvation was offered all rebels by Michael. To all who would show proof of sincere repentance, he offered, upon his attainment of complete universe sovereignty, forgiveness and reinstatement in some form of universe service. None of the leaders accepted this merciful proffer. But thousands of the angels and the lower orders of celestial beings, including hundreds of the Material Sons and Daughters, accepted the mercy proclaimed by the Panoptians and were given rehabilitation at the time of Jesus' resurrection nineteen hundred years ago. These beings have since been transferred to the Father’s world of Jerusem, where they must be held, technically, until the Uversa courts hand down a decision in the matter of Gabriel vs. Lucifer. But no one doubts that, when the annihilation verdict is issued, these repentant and salvaged personalities will be exempted from the decree of extinction. These probationary souls now labor with the Panoptians in the work of caring for the Father’s world. 53:9.3 Michael, upon assuming the supreme sovereignty of Nebadon, petitioned the Ancients of Days for authority to intern all personalities concerned in the Lucifer rebellion pending the rulings of the superuniverse tribunals in the case of Gabrielvs. Lucifer, placed on the records of the Uversa supreme court almost two hundred thousand years ago, as you reckon time. Concerning the system capital group, the Ancients of Days granted the Michael petition with but a single exception: Satan was allowed to make periodic visits to the apostate princes on the fallen worlds until another Son of God should be accepted by such apostate worlds, or until such time as the courts of Uversa should begin the adjudication of the case of Gabriel vs. Lucifer. 53:9.4Satan could come to Urantia because you had no Son of standing in residence—neither Planetary Prince nor Material Son. Machiventa Melchizedek has since been proclaimed vicegerent Planetary Prince of Urantia, and the opening of the case of Gabrielvs. Lucifer has signalized the inauguration of temporary planetary regimes on all the isolated worlds. It is true that Satan did periodically visit Caligastia and others of the fallen princes right up to the time of the presentation of these revelations. when there occurred the first hearing of Gabriel’s plea for the annihilation of the archrebels. Satan is now unqualifiedly detained on the Jerusem prison worlds.